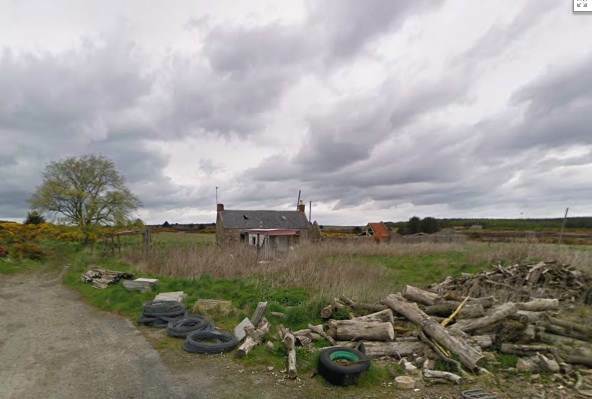 This entry was posted in Family history, Photos and tagged Cruden Bay, Fraser, Hatton, Mosside Croft. Bookmark the permalink. Do you know how many people lived there – in the two rooms plus attic? It always amazes me when huge families are crammed into tiny dwellings. The answer is lots! I’ve tracked the occupants in the census from 1841 to 1911. Which is 10 of them. There were 6 living there when my mother used to stay during the summer in the 1920s/30s, which would have made 10 when my grandparents, mother and aunt were there. The girls slept in the attic where there was a cupboard for storing the cheese. I hope to do an article about Mosside as I’ve done lots of research into the lives of crofters in that area – and I feel a trip to Aberdeenshire may be on the horizon this summer. Good grief, where on earth did they all sleep? We are so accustomed now to having a bedroom each, and apologising if people come to stay and we have to cram all their kids into one room. Makes you realise how relatively well off even today’s poorest (in this country) are. I know – reading the census makes you realise just how full of people most homes were. In a Scottish cottage like this one, there’d probably have been a box bed in the kitchen for the married couple, another box bed in the other downstairs room where several girls would have slept plus maybe truckle beds or chairs pushed together for small children. A few would have slept in the attic. Single men and older boys most likely slept in the steading, which would have been awfully cold and smelly. I’m intrigued about the deaf and dumb boarder. Have you researched that person? Interesting person to take in – was he a relative at all? Yes, I’ve done a little research into John Black. He’s first with the Fraser family at Mosside in the 1851 census, age 19 and a pauper, which means he was receiving Poor Relief from the parish. He’s there in 1861 when it says he’s a pauper, deaf and dumb from birth, and he’s still there in 1871 age 38. William Fraser died in 1877, and his son Alexander took over the lease of Mosside Croft. In the 1881 census John Black is an inmate of the Buchan Combination Poorhouse, which had opened in 1869 at Maud, New Deer, and is detailed as unmarried age 48, deaf and dumb, born Cruden and in 1891 he’s still there age 58. He died at the Poorhouse in 1897 of heart disease, and his death certificate says he was deaf and dumb, single and illegitimate, the son of Margaret Milne deceased, with no father’s name given. Trying to trace him back, the 1841 census has John Black age 11 at Hill Garth, Cruden with his mother Margaret Milne age 30 and Agnes Deary age 97. I ca’nt find a baptism for him but there’s a Margaret Milne baptised 1808 at Longside and another one baptised at Longside in 1813. Longside is where Christian Hutcheon, who married William Fraser, was from, so maybe there’s a connection there. Then in 1850 there’s a marriage between Margaret Milne and John Sangster at Cruden (William Fraser’s mother was a Sangster) but I can’t find them in the subsequent census. It may be the same Margaret, and may be when John Black went to live with the Frasers. So I don’t know whether John Black was related to William or Christian Fraser, but he was probably connected to their families somehow, or whether the Frasers took him in as a good deed or used him as cheap labour because he was in receipt of poor relief. Possibly a mixture of both! Hi – fascinating to discover a Rennie. I have two Rennies from that area on my tree. I’ll send you an email so we can be in contact that way.